Pilosio Time-lapse Keith Haring from Pilosio Spa on Vimeo. 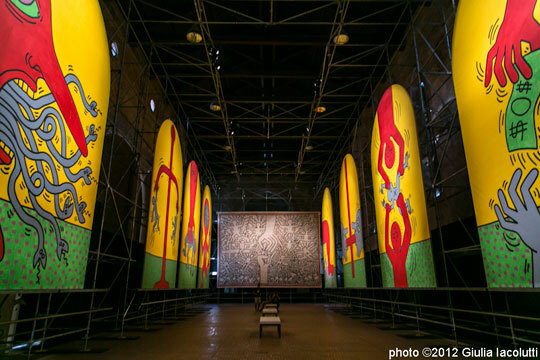 In the medieval church of San Francesco in Udine are installed eleven monumental works by the famous American artist Keith Haring: the Ten Commandments series and the painting The Marriage of Heaven and Hell, the latter the largest work he ever painted. The works on show highlight an undervalued aspect of the art and personality of the artist: his relationship with the spiritual and sacred dimension which had a primary role in his dealings with the world. As Gianni Mercurio, the curator, writes in the exhibition catalogue, “Haring’s art tends to affirm the identity of the sacred and social spheres; spirituality is a sociological presence rather than a transcendental one: in sacredness he discovers the face of the experiences of Humanity. This led to him being contrary to ‘organized religions’ in which he pinpointed false doctrines and charlatanry (such as those of television preachers). His works contain an implicit refusal of dogma which insists on regulating behaviour and social relationships, and that establishes what must be experienced and thought, how we must live and think”. The Ten Commandments is one of Haring’s most powerful series. These large-scale canvases were finished in just three days for his first solo show in a museum, in 1985: the Bordeaux museum of contemporary art, an old deposit for storing groceries that had been reconverted along the lines of a basilica with a central nave separated from the lateral ones by arcades. The interpretation of this space gave Haring the idea for developing the theme of the work: the number of arcades (ten) that were to host the works, and then the reference to the ‘sacredness’ of the architectural design and, perhaps, a memory of the iconography representing the bow-shaped tablets of the Ten Commandments. In order to realize this work, which he had conceived on the dance floor of the Paradise Garage the day before he left New York, Haring worked for three consecutive days without stopping to sleep. 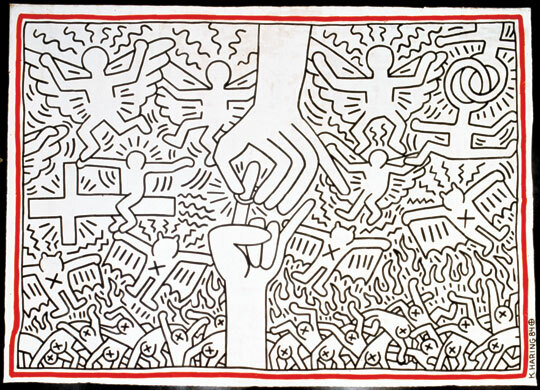 The theme of sacredness was to be found again in Haring’s work in The Marriage of Heaven and Hell, a large (over 7 metres high and 13 metres wide) black and white canvas; this was created in 1985 for the choreography by Roland Petit for the Ballet National de Marseilles and based on the title of a book written and illustrated by the English poet and painter William Blake between 1790 and 1793. In Haring’s work the sacrament of marriage is consumed by rejoicing angels who circle above an infernal swarm of the damned; the representation of Christian symbols are inextricably entwined with Haring’s usual way of expressing himself through allusions and symbolic disguises in a composition that becomes phantasmagorical, with weightless figures flying through an indefinite space.